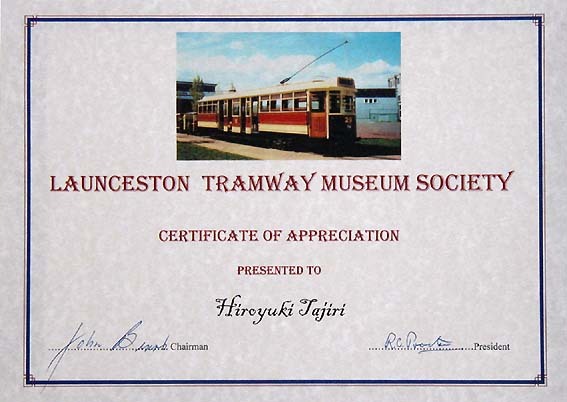 Mr. H Tajiri, a member of KRC, has been Tasmania Austoralia on January 2001. 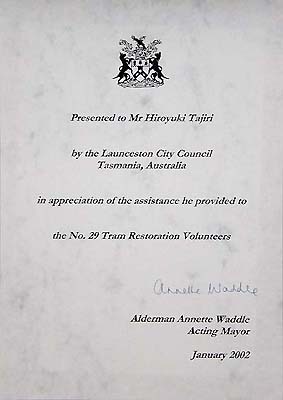 When he visited above Tramway Museum, Mr. Ralph Proctor who is president of the Society told him "We are looking for 3'6" bogie trucks with motor for restoration of our No.29 tram car"
He began to search in japan with support from some KRC members, then he could find the bogie that they want at Nagoya Railroad Co. in August. After so many conversation with Museum, Nagoya Rd. and Shipping company. The bogies and related components that were salvagrd from MO575 tram car of Gifu division of Nagoya Rd. were shipped on 26 October. Museum received those goods on 30 November. 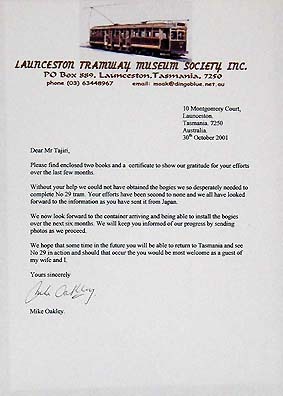 They much pleased and sent certificate of appreciation to Mr. Tajiri We will expect within a year that ex Launceston Municipal No.29 begin to run.